While many sincere and well-meaning, but MISGUIDED Christian pastors, preachers, and teachers, have argued that the word "Allah" is simply the Arabic word for "God", the facts are something quite different. Even among Islamic scholars there is general agreement that the term "Allah" refers to a pagan deity before Islam came into existence under the leadership of Mohammed. The pre-Islamic Arab culture spoke of 360 gods of which "Allah" was simply just one of them. The correct Arabic name for "God" is the word "Al-ilah". And it must be stated that it became a generic title for whatever god was considered the highest god. EVERY Arab tribe used "Allah" to refer to its own particular high god. For example, the moon god called "Hubal" was the god to whom Arabs prayed at the Ka'aba and when they prayed they used the name "Allah". Historians have said that "Allah" was the chief of the 360 gods that were worshiped in Arabia at the time that Mohammed came to prominence. Now, some Muslims will become angry when hearing this history about "Allah". They don't want to believe or accept that "Allah" was already being worshipped at the Ka'aba in Mecca by Arab pagans before the time of Mohammed. There is also evidence that the term "Allah" was used by heathen Arabs not only in Arabia but also among the Nabateans. The name "Allah" was well known in PRE-Islamic Arabia (as even the Qur'an testifies). Even the feminine form of the word is "Allat" (simply means "the goddess"), and is found in many inscriptions from North Africa as well as in Arabic inscriptions prior to Islam. "Allah" is NOT a common name in Arabic for "God". Muslims must use another word or form to indicate any other than their own peculiar deity. Other gods mentioned in the Qur'an are all FEMALE deities: "Al-Lat" and "al-Uzza" and "Manat" which are represented by the sun, the planet Venus, and Fortune or Destiny. At Mecca they were regarded as the daughters of "Allah"
Among the pagan Arabs before the time of Mohammed, the term "Allah" represented the chief god of their particular pantheon at the Ka'aba with its 360 idols. 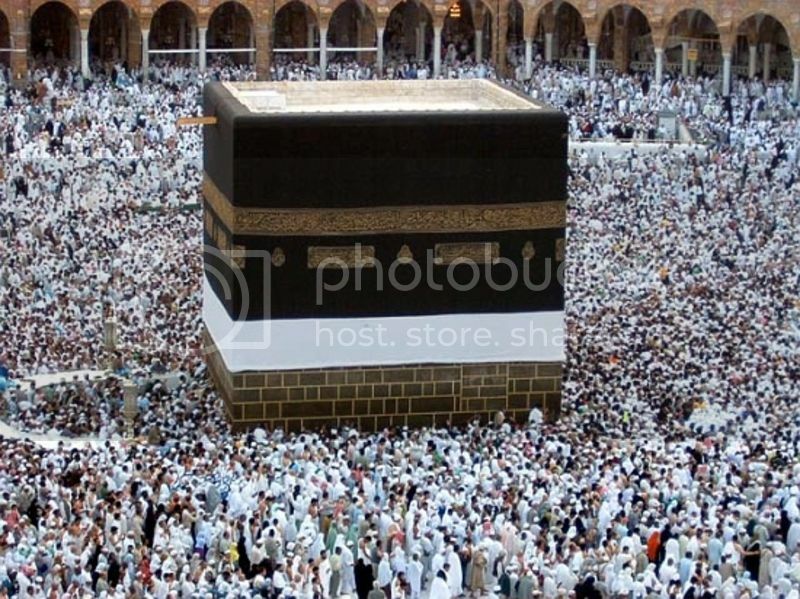 The central shrine at Mecca, the Ka'aba, is a cube-like stone structure that has a black stone in one of its corners that must be kissed as an ESSENTIAL ritual of the Haj, the pilgrimage that all Muslims must take at least once in their life to Mecca. REMEMBER: since Satan is the ruler of this World, God allows him a certain degree of latitude of action which most Christians do not fully appreciate. NON-believers of Christ are taken captive by the devil AT HIS WILL. 2 Timothy 2:26. “And He is the Head of the Body, the Church; Who is the beginning, the first born from the dead; that in all things He might have the preeminence.” Colossians 1:18 . We can only touch on the glories of our LORD Jesus Christ and the eternal relationships between this One who is called Wonderful, Counselor, Mighty God, Everlasting Father, Prince of Peace, and the redeemed sinner who is already seated with that glorious Savior in the heavenlies.Ephesians 2:6 . Isaiah 9:6 . “The LORD of Glory.” 1 Corinthians 2:8 . “The Prince of Life.” Acts 3:15 . “The Brightness of God’s Glory.” Hebrews 1:3 . He was in the form of God. Philippians 2:6 . He was with God. He was God. John 1:1-2 . The Father said, “Let all the angels of God worship Him.” “Unto the Son He saith, ‘Thy throne, O God, is forever and ever'” Hebrews 1:6-7 . “Christ came, who is over all, God blessed forever”Romans 9:5 . And Thomas said unto Him (Jesus), “My LORD and my God” John 20:28 . “He is before all things and by Him all things consist” Colossians 1:17 . By Jesus Christ, God made the world and all things. Ephesians 3:9 . In Him dwelleth all the fullness of the Godhead bodily. Colossians 2:9 . All judgment is committed into His hands. John 5:22 . He knows all things.John 21:17 . God hath appointed The LORD Jesus Christ heir of all things. Hebrews 1:2 . Therefore the Son could truthfully say, “All things that the Father hath are mine.” John 16:15 . All of the promises of God are yea and amen in Christ Jesus. 2 Cor. 1:20 . This is the Savior who was made after the power of an endless life. Hebrews 7:16 . This is the LORD of Glory who for sinners was crucified. 1 Corinthians 2:8 . Is it any wonder He could say, “I am He that liveth, and was dead; and behold I am alive for evermore, Amen; and have the keys of hell and death” Revelation 1:18 . 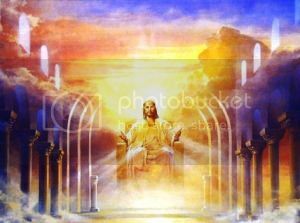 “I am Alpha and Omega, the beginning and the ending, saith the LORD, which is, and which was, and which is to come, the Almighty” Revelation 1:8 . The Scriptures, the Written Word, testify of Jesus Christ, the Living Word. John 5:39 . This Christ is the Head of the Body, the Church. Sinners saved by grace are members of that Body. “And they two shall be one flesh. This is a great mystery; but I speak concerning Christ and the Church” Ephesians 5:31 . The LORD Jesus Christ is the true vine and sinners saved by grace are the branches. John 15:1-8 . “The Shepherd and Bishop of our souls” 1 Peter 2:25 . “The Author and Finisher of The Faith” Hebrews 12:2 . “The Apostle and High Priest of our confession” Hebrews 3:1 . This is the Christ who died that “He should gather together in one the children of God that were scattered abroad” John 11:52 . “That in the dispensation of the fullness of times He might gather together in one all things in Christ, both which are in heaven, and which are on earth; even in Him” Ephesians 1:10 . The believer is in Christ. Romans 8:1 . 2 Cor. 5:17 . Christ is in the believer. Galatians 2:20 . Colossians 1:27 . The believer in Christ is accepted in the Beloved; he is complete in Him; is a new creature in Him and is free from condemnation in Him.Romans 8:2 . Ephesians 1:6 . Colossians 2:9 . 2 Cor. 5:17 . “He is our Righteousness” 1 Corinthians 1:30 . “He is our Peace” Ephesians 2:14 . “He is our Sanctification” 1 Corinthians 1:30 . “He is our Saviour” Titus 1:4 . “He is our Passover” 1 Corinthians 5:7 . “He is our Redemption” 1 Corinthians 1:30 . “He is our Hope” 1 Timothy 1:1 . “He is our Life” Colossians 3:4 . “He is our Resurrection” John 11:25 . He is the one Mediator between God and men. 1 Timothy 2:5 . “But God forbid that I should glory, save in the cross of our LORD Jesus Christ, by whom the world is crucified unto me, and I unto the world.” Galatians 6:14 . All of the Eternal Purposes of God are centered in that Only Begotten and Well Beloved Son with Whom He was well pleased; that One who was ever the eternal bosom‑companion of His Father; and not only that, but they are centered in that cross of Calvary where that Son, obedient unto that cruel death, was made sin, that we might be made the righteousness of God in Him. We will be singing His praises for all eternity and will never tire of hearing of His glories. “Worthy is the Lamb that was slain to receive power, and riches, and wisdom and strength, and honour and glory and blessing” Revelation 5:12 . So we are rejoicing in the fact that we are serving and worshiping a living, resurrected, glorified Saviour, who is our Advocate at God's right hand, where He ever liveth to make intercession for those who are saved. But let us remember that it is one thing to know Him as the Saviour from the penalty of sin, while it is something different to daily acknowledge Him as LORD, knowing Him with Paul in the fellowship of His sufferings and in the power of His resurrection. Philippians 3:10 . As Disciples of Christ, we are not to be unequally yoked together with unbelievers. And surely no Christian can consistently be a member of any fraternal organization whose members dishonor our LORD and/or deny His Deity. “All men should honor the Son even as they honor the Father” John 5:23 . Let us never receive the teaching of any man or woman, that the eternal Christ was the “creation” of the eternal Father before the world began. The LORD Jesus Christ of the Bible said, “He that hath seen Me hath seen the Father” John 14:9 . After the order of Melchisedec, Christ is without father or mother, beginning of days or end of life. Hebrews 7:3 . He is pre‑existent, co‑existent with the Father and self‑existent. He was called “God” by the Father.Hebrews 1:8 . Romans 9:4-6 , 1 John 5:20 . Isaiah 9:6 . John 1:1-3 . “Who is the image of the invisible God, the firstborn of every creature:” “For by him were all things created, that are in heaven, and that are in earth, visible and invisible, whether they be thrones, or dominions, or principalities, or powers: all things were created by him, and for him:” “And he is before all things, and by him all things consist” Colossians 1:15-17 . “Believe on the Lord Jesus Christ, and thou shalt be saved” Acts 16:31 , while there is still time! Only Christians are the children of God, and only because of the Faith in and of, the LORD Jesus Christ. Children of God! God is not some impersonal principle, or some unknown inanimate force. God is a living, personal God. Some religious people know Him as the Supreme Being, but His children know Him as God the Father. Ephesians 1:3 , 1 Peter 1:3 and 2 Cor. 11:31 . “Neither knoweth any man the Father, save the Son, and he to whomsoever the Son will reveal Him” Matthew 11:27 . “God is Spirit” John 4:24 . 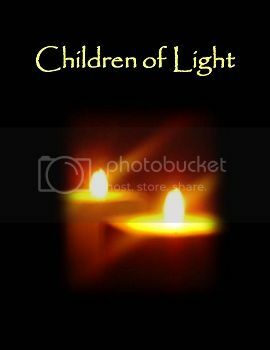 “God is light” 1 John 1:5 . “God is love” 1 John 4:8 . “Our God is a consuming fire”Hebrews 12:29 . “This is life eternal that they might know Thee, the ONLY true God, and Jesus Christ whom Thou hast sent” John 17:3 . When we believe and receive Christ, we are instantaneously born of God and become the children of God. John 1:12-13 . Then we belong to the Household of God. Ephesians 2:19 . “For which cause He (The LORD Jesus Christ) is not ashamed to call them brethren.” Hebrews 2:11 . The LORD Jesus Christ said, “Go to my brethren, and say unto them, I ascend unto my Father, and your Father, and to my God, and your God.” John 20:17 . The Bible is very clear in its teachings that a person has to be born into the Family of God. One of the lies of Satan is that ALL men are the children of God. To be sure all have their being in God; for there is no life apart from the living God. BUT, it is one thing to be born of blood, the will of the flesh and of man; but something ENTIRELY DIFFERENT and separate to be born of God. John 1:13 . Now, for example, the Prodigal Son had departed FROM his father’s house: some saints do, in this way, depart from God’s House and return. But NO UNSAVED one was ever IN God’s House. Remember, through unbelief, Adam departed from God and took the whole human race with him. Now, to those religious “enlightened” men who rejected Him, the LORD Jesus Christ said, “Ye are of your father, the devil.”John 8:44 . To another the Apostle Paul said, “Thou child of the devil.” Acts 13:10 . Also, “In this the children of God are manifest, and the children of the devil.” 1 John 3:10 . Therefore, we see there are two kinds of children in the world, and the cross of Calvary stands between them. What a sad day it will be when the great multitudes of religious people who are asserting sonship without obtainingRegeneration, will stand with all their guilt and sin uncovered before the true and Holy God in that awful Day of Judgment! Some religious self-righteous sinners are trying to behave like children of God without having experienced regeneration, without having received His Divine nature, the new birth which is the imperative for Divine sonship. Read Titus 3:5-7 . Remember, it is one thing to be born of human parents within the natural law of procreation; it is another thing to be born of God by the transforming power of the Holy Spirit. That which is born of the flesh is flesh. “Ye must be born again, ‘from above,’ of the Spirit” How? By believing and receiving Christ, as your LORD and Savior. John 1:12 . “He that hath the Son hath the Father.” 1 John 3:1-7 . “And because ye are sons, God hath sent forth the Spirit of His Son into your hearts, crying ‘Abba Father.”’ Galatians 4:6 . “The Spirit Himself beareth witness with our spirit that we are the children of God; and if children, then heirs, heirs of God and joint-heirs with Christ.” Romans 8:17 . “The Father Himself loveth you, because ye have loved Me.” John 16:27 . When the Apostle Paul wrote to the Philippians these words, “my God shall supply all of your need according to His riches in glory by Christ Jesus” Philippians 4:19 , he was confirming the statement of The LORD Jesus Christ, “If ye then, being evil, know how to give good gifts unto your children, how much more shall your Father which is in heaven give good things to them that ask Him.” Matthew 7:11 . 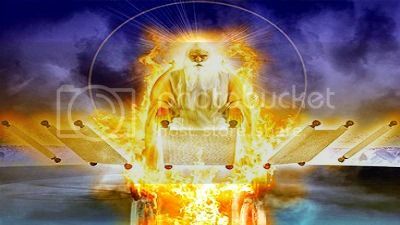 The personality and deity of the Holy Spirit, the third Person of the Trinity, are clearly set forth in the Scriptures. Christ said, “And I will pray the Father, and He shall give you another Comforter (or Paraclete).” John 14:16 . This is the same word translated “Advocate.” 1 John 2:2 . When Ananias lied to the Holy Spirit, he lied to God. Acts 5:3-4 . “And the Holy Spirit said” Acts 13:2 . 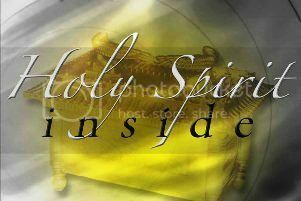 “The Holy Spirit Himself maketh intercession for us with groanings which cannot be uttered” Romans 8:26 . In the Old Testament Scriptures the Second and Third Persons of the God‑head were latent; in the New Testament Scriptures they are patent. Christ, beginning with the Book of Matthew is patent; The Holy Spirit, beginning with the Book of the Acts is patent. The dispensation of the Holy Spirit was ushered in after the resurrection of the Son of God. 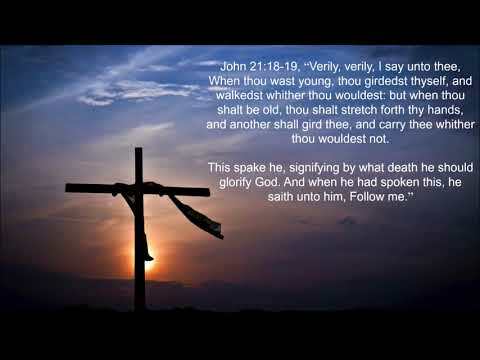 Before the Son of God went to the cross “the Holy Spirit was not yet given” John 7:39 . Now, PAY ATTENTION, It is unscriptural for any Christian to pray for, or to seek for, more of the Holy Spirit.However, It is all right to pray that the Holy Spirit may have more of the child of God. It is likewise unscriptural to ask God to send down the Holy Spirit from Heaven. When Christ was on earth He said, “I came down from heaven.” The Bible says that the Holy Spirit has been sent down from heaven. 1 Peter 1:12 . How foolish would John have been, had he looked up to heaven and prayed for God to send down from heaven His Son, when John’s head was leaning on His bosom at the time. It is equally as foolish for a Christian with the Holy Spirit in his bosom to pray that the Third Person be sent down from heaven today. The Holy Spirit bears witness of the resurrection of the believer’s sonship. Romans 8:16 . He is the believer’s assurance of his incorruptible inheritance at the LORD’s coming. Ephesians 1:14 . Therefore he is the witness of the LORD’s return. Ephesians 4:30 . Just as truly as there is one Father and one Son, there is one Spirit, and one Body. Ephesians 4:4 . And, just as truly as there are infidels in the congregations preaching another Jesus, there are fanatics in the congregations preaching another spirit. 2 Cor. 11:4 . The world cannot receive the Spirit. John 14:17 . The Spirit convicts the world of sin, righteousness and judgment. John 16:8 . If the sinner under conviction yields to the Sinbearer, he is drawn by the Spirit to the Son. John 6:44 . Then he is born of the Spirit.John 3:5 . As no one can work for salvation, which is a free gift from God, no one can work for the Holy Spirit. We receive the Holy Spirit by the hearing of The Faith. Galatians 3:2 . The Holy Spirit is given unto believers. Romans 5:5 . Therefore we do not have to agonize or go through physical contortions or have others put hands on us in order to receive the Holy Spirit. I pray I am being clear on this! It’s important. No Christian is ever sealed because of an interval between the time of believing and the time of sealing; but every Christian is sealed by the Holy Spirit, because he believes the Gospel of Grace of his salvation. Moreover he is sealed unto the day of redemption. Ephesians 4:30 . No Christian could possibly have the experience of the certain disciples whom Paul met in Ephesus. They had previously received John’s message and baptism, which have had no place in the Body of Christ since that time. Acts 19:1-5 . Paul’s question should be correctly translated, “Having believed, received ye the Holy Spirit.” Acts 19:2 . Take NOTE: The anointing which the believer receives when first he believes abides in him. 1 John 2:27 . There is one Spirit and one baptism. Ephesians 4:4 . When an individual is born into the family of God, by the work of the Holy Spirit, he is taken into, and made a member of the Body of Christ. The work of the Holy Spirit which puts the believer into the Body of Christ is called, “Baptized in or by the Holy Spirit” 1 Corinthians 12:13 . Some of these false teachers often quote the experience of Peter and the Eleven who were saved with Christ in the days of His flesh, and then were baptized by the Holy Spirit after His resurrection. Let us remember that they were His disciples before His death, that is, before the Holy Spirit was given. John 7:39 . They were with Him while He was under The Law, preaching the Kingdom of Heaven message to the lost sheep of the House of Israel. Galatians 4:4 . Matthew 10:1-5 . Those disciples had the unique experience of living, as disciples of Jesus, before His death and resurrection in the Old Testament and also after His resurrection in the New Testament. Now, the Christian, who is sealed with the Holy Spirit, can grieve the Holy Spirit and can quench the Holy Spirit. Ephesians 4:30 . 1 Thessalonians 5:19 . It is the duty of every Christian to walk in the Spirit. Galatians 5:16 . All Christians are temples of the Holy Spirit but very few of them are walking in the Spirit in the degree that they should. When a Christian walks in the Spirit he manifests the Fruit of the Spirit, against which there is no law. Galatians 5:22-23 . He fulfills the righteousness of the law.Romans 8:4 . All true Christians have been baptized by the Holy Spirit, but how few today are obeying the Word of God in this command, “Be filled with the Holy Spirit” Ephesians 5:18 . The Christian who has the sweetest fellowship with the LORD, who experiences the greatest joy of salvation, who serves God with the greatest power, who triumphs over the world, the flesh and the devil, is the one who is filled with the Holy Spirit. During the “Acts” period, the thirty plus years from Acts 1:1 to Acts 28:31 , there were several baptisms, “Holy Spirit baptism”in fulfillment of Joel’s prophecy, “water baptism” and “baptism into the death of Christ” Acts 2:16-38 . Acts 19:1-7 . Romans 6:3-4 . Joel prophesied concerning the “last days” particularly concerning Israel’s kingdom age. Joel 2:28-30 , concerning the outpouring of the Holy Spirit, will not be fulfilled during this “grace” period. Whatever we may have in mind when we speak of Holy Spirit baptism, let us never forget that the anointing of the Holy Spirit is a once‑for‑all anointing. 1 John 2:27 ; that the sealing, anointing and baptism, of, in, or by, the Holy Spirit is always a past experience with the true Child of God! Compare the “death” baptism of Christ in Luke 12:50 with the baptism of Romans 6:3 , Colossians 2:12 and Ephesians 4:5 . “But this spake He of the Spirit, which they that believe on Him should receive: for the Holy Ghost was not yet given; because that Jesus was not yet glorified” John 7:39 . “What! Know ye not that your body is the temple of the Holy Spirit, which is in you, which ye have of God, and ye are NOT YOUR OWN? For ye are bought with a price: therefore glorify God in your body, and in your spirit which are God’s.” 1 Corinthians 6:19-20 .